San Diego, Calif. – City of San Diego Fire-Rescue Dept. Lt., Andy Lerum, who has been at the forefront of bringing the latest technology to the city’s lifeguard division, is the 2016 recipient of the City of San Diego/National University Professional Development Scholarship. The scholarship will go toward Lt. Lerum’s bachelor’s degree studies at National University – among the largest, private, nonprofit universities in California and the City of San Diego’s designated Preferred Employee Education Program Partner. National University’s designation as the City of San Diego’s Preferred Employee Education Program Partner reflects National University’s commitment to developing educational collaborations with the communities it serves. In turn, it provides San Diego employees access to a quality education that ensures the city’s continued development as a place of opportunity and innovation. 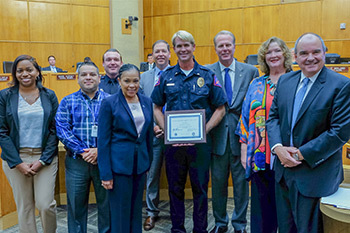 Lt. Lerum, along with three finalists, were recognized at the Sept. 13 San Diego city council meeting by National University President Dr. David W. Andrews, San Diego Mayor Kevin L. Faulconer, and other elected officials. He will be pursuing his bachelor’s degree in information technology or digital media from National University. The three finalists are: Albert Molina, Public Utilities Department; David McGowan, San Diego Police Department; and Portea Carter, Office of Homeland Security. Lt. Lerum and the three finalists were chosen by a panel of City of San Diego and National University representatives for their demonstrated commitment to public service and giving back to the community. Besides keeping a close eye out for ocean swimmers in distress, Lt. Lerum is self-taught in computer technology and became the lead administrator and programmer for the lifeguard division’s computer-based scheduling system. He left Santa Rosa Junior College before earning an associate’s degree more than 30 years ago, when he landed a lifeguard job in San Diego. Lt. Lerum, who has long served as one of the lifeguard division’s public information officers, said he looks forward to earning a bachelor’s degree at National University so that he can advance his own technology background and contribute even more to the city’s digital and technological efforts. National University has long been an educational leader in California, and about 25 percent of San Diego Unified School District principals are National University alumni, as are former San Diego Mayor Jerry Sanders, now President and CEO of the San Diego Chamber of Commerce; San Diego City Councilwoman Myrtle Cole; and San Diego City Councilwoman Marti Emerald.